August has arrived and with it the peak summer season on the Amalfi Coast. The beaches are crowded and colorful, the water is refreshing and the days perfect for heading to the beach. 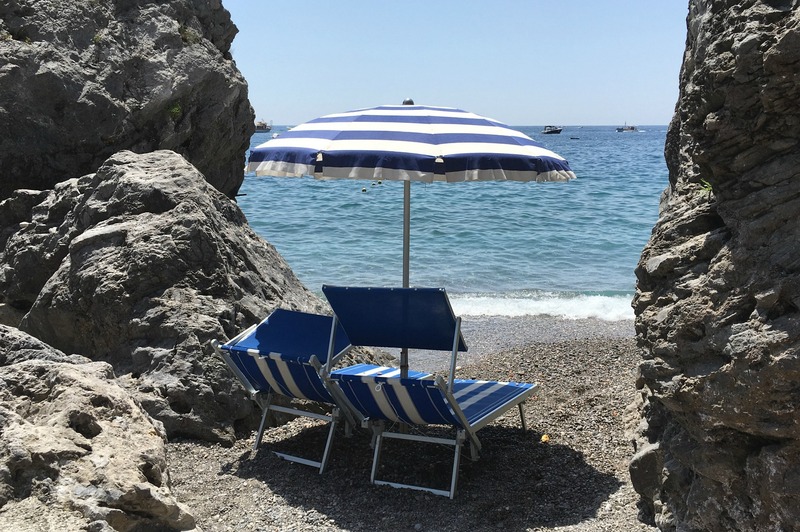 Whether you’re packing your bag for a summer holiday on the Amalfi Coast or simply dreaming of your next getaway, here’s a look at some of my favorite ways to enjoy this splendid time of year on the Amalfi Coast! The beaches of the Amalfi Coast are justifiable famous for their dramatic shores and incredibly blue sea that changes in color from deep cobalt to brilliant turquoise and every shade in between. Yet there’s another thing you should know about the beaches before you arrive ready to relax – they are rocky. It’s better to come prepared, which definitely means packing a pair of flip flops (preferably a pair you don’t particularly love) or beach shoes. A lot of people wear them just to the edge of the water to protect their feet from the hot hot hot hot stones that are for some people (even locals!) uncomfortable to walk on. So with all those rocky beaches, just throwing a towel down isn’t always very comfortable. The way around that is to rent a sunbed and umbrella for the day. It’s very much worth it! The local beaches all are well equipped to ensure a comfortable day at the beach. The other advantage of renting a sunbed from a stabilimento balneare is that it generally means you can take a shower and take advantage of the changing cabins as well. They area also usually attached to restaurants or have a beach bar where you can get sandwiches and drinks. Very handy! Not sure where to go? 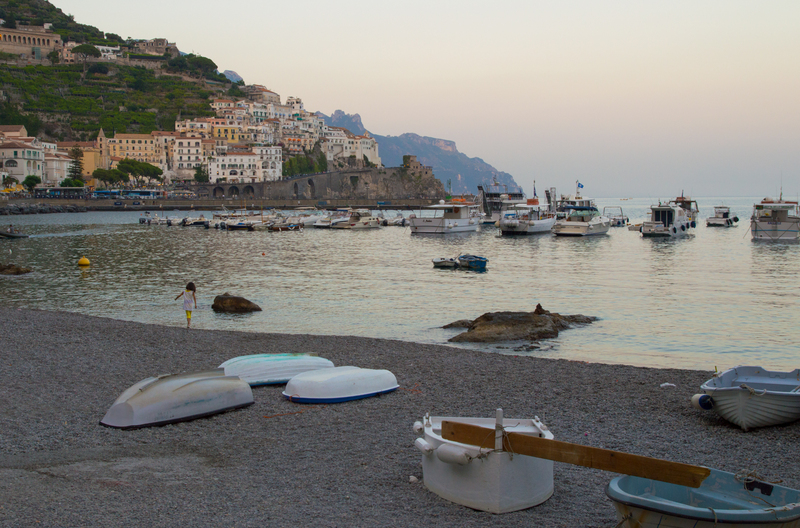 Check out my guides to the Beaches of Amalfi and Beaches of Positano for some ideas! Got a sunbed? Got an umbrella? Perfect! Now all that you need is a good book and you’re set. Why not make it a book set on the Amalfi Coast or nearby to really immerse yourself in the area? I made a list awhile back of great Summer Reads for Amalfi Coast Lovers. You can dip into that list for inspiration, but it does need a bit of updating. 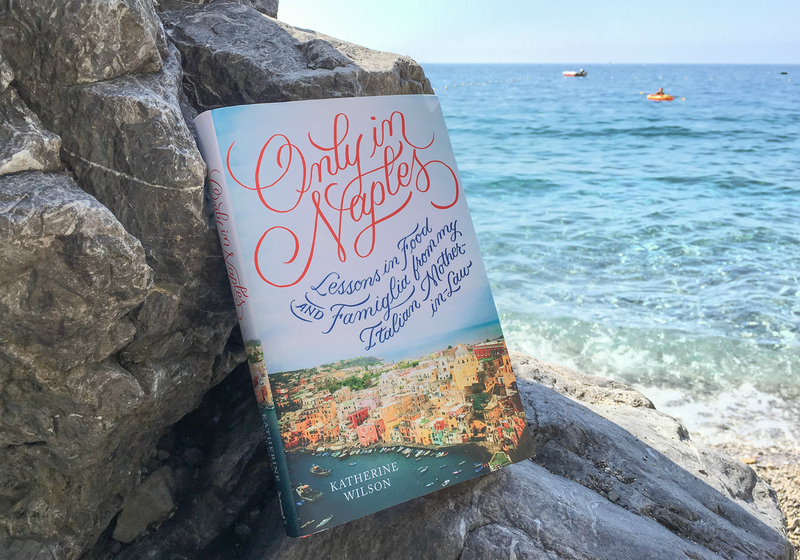 For instance, I just finished reading Only in Naples: Lessons in Food and Famiglia from my Italian Mother-in-Law by Katherine Wilson. And I didn’t want to put it down even to take a swim in the sea just steps away! Put it on your summer reading list if you love the Amalfi Coast, Naples, Campania, Italy … or all of the above. You won’t regret it! 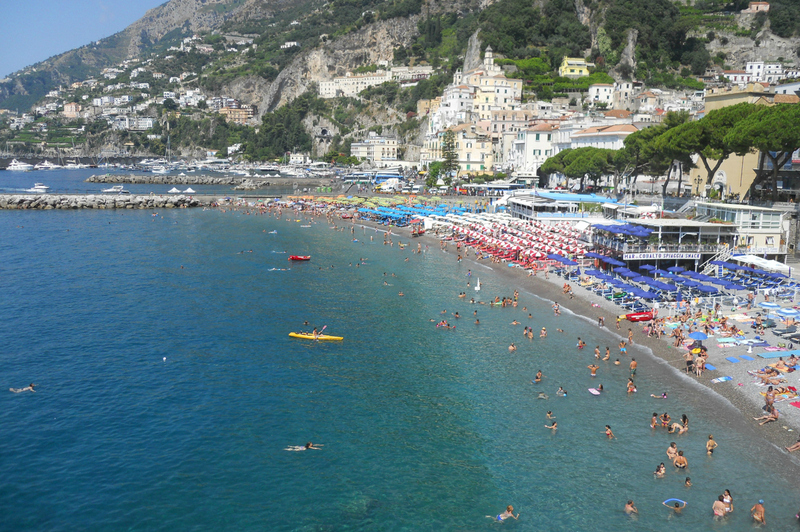 A day (or two or three or four …) spent relaxing by the sea is a must while visiting the Amalfi Coast during the summer. Yet if you’re here this time of year there’s another way to enjoy the beauty of the Amalfi Coast – from the sea. One of the best ways to get around is to take the ferry on the Amalfi Coast, since you get to see the epic coastline and avoid all the traffic and crowded buses. 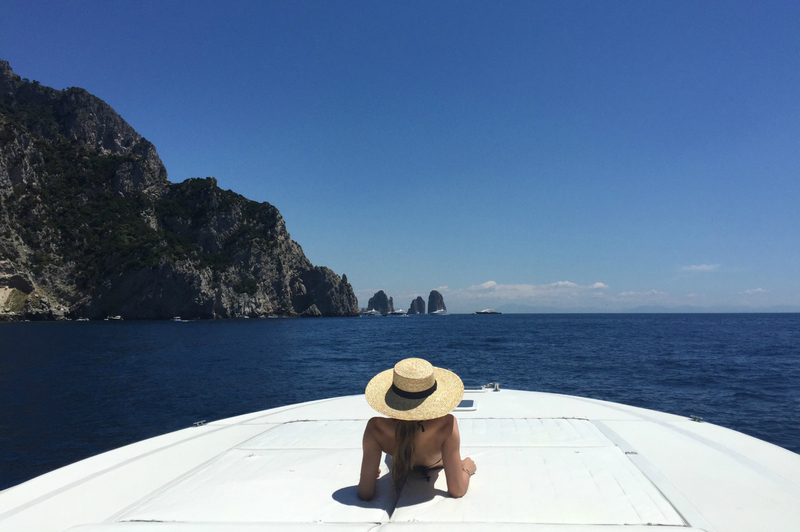 However, if you have the time and love the sea, there’s no better way to see the Amalfi Coast than by getting out on a private boat. With a small boat you can cruise along very close to the rocky cliffs, discover little coves and beaches only accessible by boat, go into stunning caves and grottoes and swim in the most incredible spots like around the Li Galli islands. All at your own pace! If this sounds like heaven, you’ll want to drop my friend Valeria at Exclusive Cruises a line. They know all the best spots and can help you plan an incredible day out on the sea on the Amalfi Coast or anywhere in the area! If your normal idea of going out to eat means getting in your car and driving to a restaurant, then there’s something fun you can do on the Amalfi Coast. There are a lot of amazing restaurants near Amalfi, Positano, Conca dei Marini and other towns that are only reachable by boat (or sometimes a ton of steps). This is a fun way to get out on the water and dine right on the beach overlooking the sea. Most restaurants have complementary boat service from the largest town nearby. 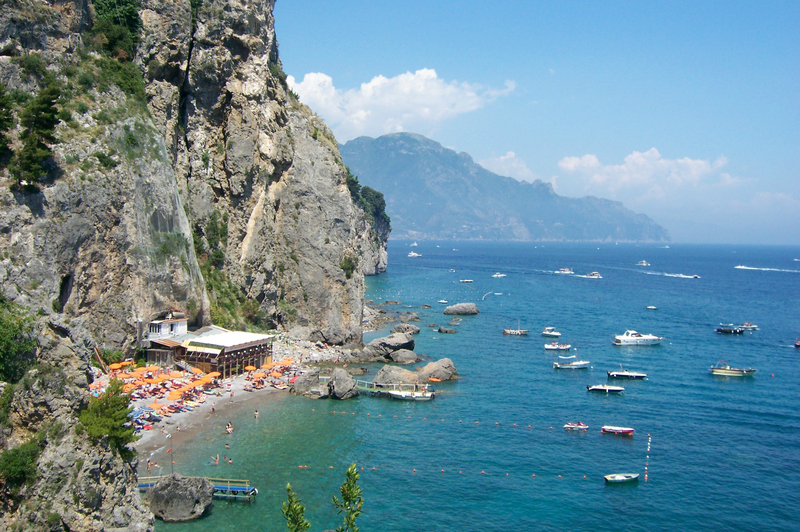 You might like to try Da Adolfo in Positano or Santa Croce in Amalfi – two of my favorites! Perhaps you’re thinking that you can put peaches in your white wine at home, and that’s certainly true. But what you can’t quite capture is that delicious combination of Amalfi Coast Falanghina wine with ripe peaches mixed with the salty breeze from the beach and sound of waves tumbling onto a rocky shore. Heck I can’t even recreate it in my own home here! 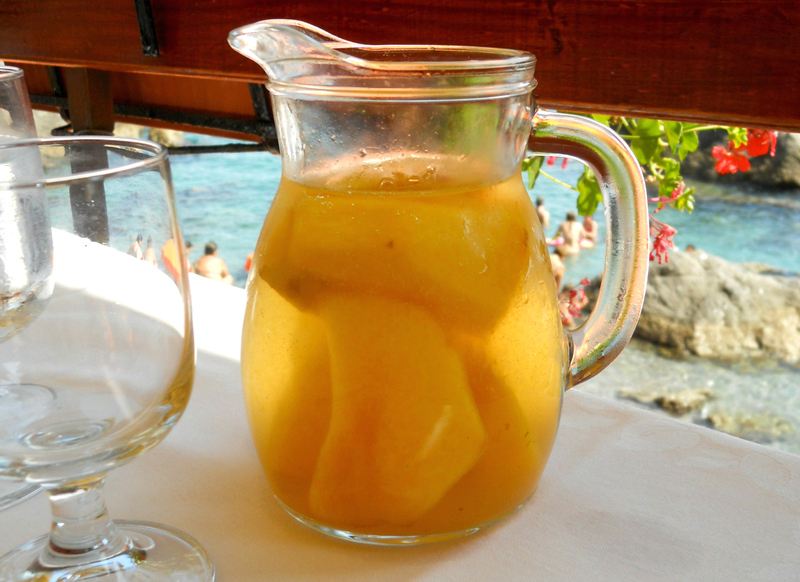 While you can find this heavenly concoction at many beachside restaurants, my favorite is at Ristorante Da Teresa at the Santa Croce beach just west of Amalfi. After the summer day tripping crowds reluctantly leave, something magical happens. I love the Amalfi Coast any time of the day, but during the summer when the days are long and hot there’s nothing quite like heading out in the evening. Sunset is particularly gorgeous from Praiano and Positano, but in Amalfi the evening hours are very special, too. The town turns pink, families bring their kids out to play along the the waterfront and the sea becomes an Impressionist painting of shimmering colors. Most of all, compared to the hustle and bustle of the day, there’s a peace that settles over the villages. These are the long, languid days of summer that we never want to end! – What do you do to enjoy the best of summer on the Amalfi Coast?